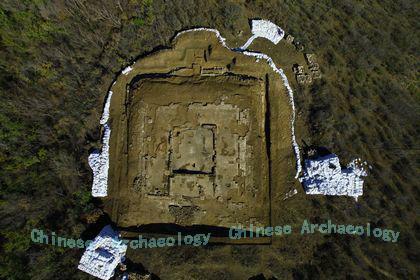 A joint Archaeological Team whose members come from the Second Inner Mongolian Team of the Institute of Archaeology (CASS) and Inner Mongolia Institute of Archaeology and Cultural Relics excavated the Heilongmen (Black Dragon Gate) Site (namely, Gate Site No. 1) and Foundation Site No. 4 of the Liao Era Zuling Mausoleum from July through October, 2010. Zuling, the mausoleum built for Yelü Abaoji, the first emperor of the Liao Era, is located in a valley northwest of Shifangzi Village (Gacha), Chaganhada Sumu, Bairin Left Banner (Chi. Balin zuoqi), Inner Mongolia. The graveyard, surrounded by mountains, has only one narrow opening close to the southeast section of Zuzhou City. The mausoleum gate near the opening (namely, what we have named Gate Site No. 1) is the “Black Dragon Gate” as recorded in the History of the Liao (Liaoshi). “Along with grandiose gate towers, the well preserved “Black Dragon Gate” is composed of tunnels, piers (partition walls), walls, ramps, and ducts. To the two sides of the gate are mausoleum walls. Next to the interior (i. e. north) side of the east mausoleum wall are ramps. Imposing architecture related to the gate tower is built over tunnels, piers, and walls. The gate has a horseshoe shape (similar to the Chinese graph凹). The side of the gate is slightly shorter than the two side walls. The gate is a three-tunneled construction. The east and middle gate tunnels are relatively well preserved. They are both timber-frame structure which is approximately 18.6 meters long. Stone plinths are installed to the lower section of the east and west tunnel walls, on top of which are wooden plinths. Mortises are carved on the plinths. 13 or 14 crotch pillars are placed in these mortises. 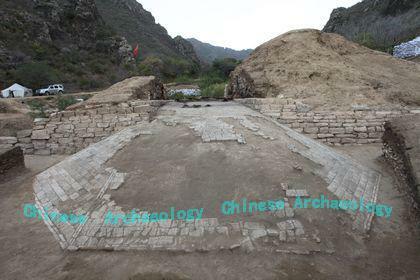 This distinct structure of the gate tunnel is not seen in the Central Plain of Han through Song dynasties. In the middle of the tunnels are well preserved kingpost stones and bearing stones. Originally they should have had double-leaf doors. On the ground of the tunnels are remains of burnt wooden architectonic devices as well as iron doornails and iron knockers. Two piers are found near the “Black Dragon Gate.” The main body of the piers is built of rammed earth. The lower section of their south and north surface is covered with stone while the upper section is covered with bricks. The imposing walls to the two sides of the gate have pounded earth and pebbles inside and are covered with stone outside. Next to the north side of the east wall is a ramp leading to the top of the wall. Remains of a 3-bay wide and 3-bay deep structure can be seen on top of the east wall. On top of both east pier and east wall are discovered reversed-bowl-shaped stone plinths as well as brick and tile relics, indicating there were originally big timber-frame structures at these locations. Foundation Site No. 4 is situated to the southeast of attendant tomb No. 1. It should be a building of sacrificial hall kind. 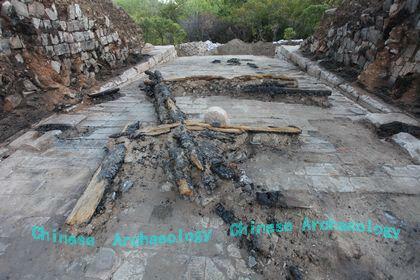 The foundation of the site is nearly a square in shape, 23 meters wide from south to north, and 24.7 meters deep. Its east, south, and north sides are covered with bricks. The structure itself faces east, 5 bays wide, and 5 bays deep. The flooring paved with square brick. There are in total 20 reversed-bowl-shaped stone plinths all around. In the center of the site is a rectangular chamber (F 1). Its gateway faces east, 7.1 meters deep, and 6.6 meters wide. The flooring uses square bricks decorated with mat patterns. The four brick walls are white-washed with lime. Inside the walls are postholes, into which are installed stone plinths. Behind chamber F1 is a small room sealed with walls on its four sides. At the south and north sides of the site are two south-north partition walls, forming another two independent units (F 3 and F 5). The rest area is thus reversed horseshoe shaped, constituting the antechamber section of the structure (F 2). Overall, the architectural composition of this site is quite distinct, rarely seen in other buildings. The four edges of the site are used as platforms. There is a long ramp at the central south of the eastern part. A south-north-oriented rectangular table board is built to the west of the ramp. A small pit (K 1) is found at the south edge of the table board. 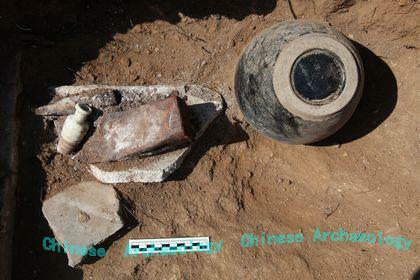 A group of well preserved vessels, including two porcelains, 2 bronze objects, and 3 iron vessels, have been discovered from the pit.